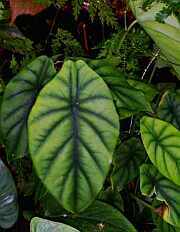 I saw this one in UC Berkeley Botanical Garden greenhouse. It had no labels around it and grew in a very dark corner. It has been identified by Dr. Alistair Hay. The feat of identification has been made possible by the Aroid-L mailing list (this species was not published yet as of July 1998). 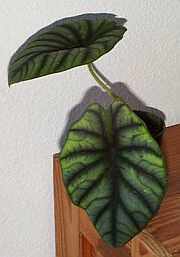 The leaves resemble a very cholorotic A. cuprea. A couple of months later, I managed to purchase a very similar plant in a local nursery.